Once again I give you a view into my classroom to show you what we are working on. This week we are learning to do research (CCSS W.3.7), gather notes (CCSS W.3.8) and practice expository writing (CSSS W.3.2). These 3 standards integrate well with social studies. This week my students are researching Dr. Martin Luther King, Jr’s life. Rather than just teach them about Dr. King (and they actually know quite a bit already from learning about him grades k – 2), I decided to have them do research on their own by researching online with the Chromebooks. In my district, each 3-5 grade classroom is 1:1 with Chromebooks. Each student received a research packet that included a note or fact gathering page and a bibliography page. 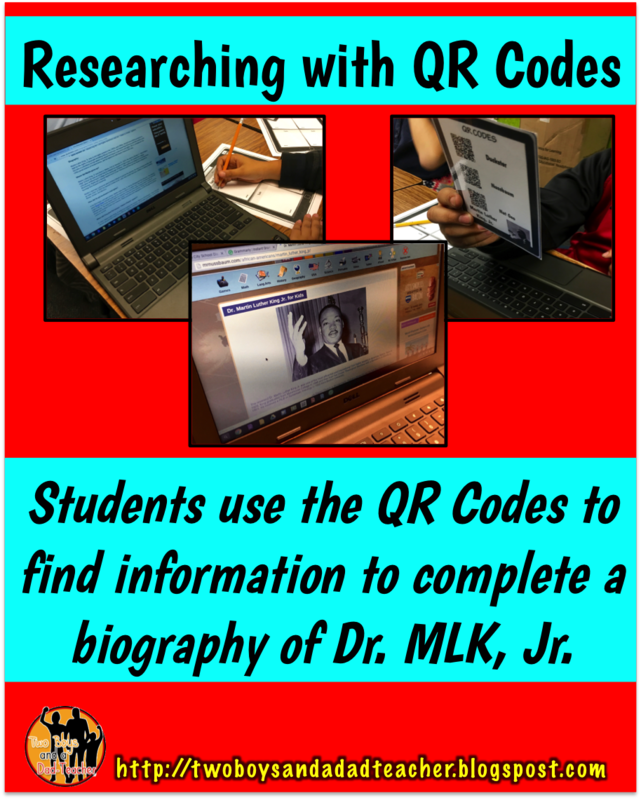 Each student also got a card with 3 QR codes with 3 websites that I searched for ahead of time. I found websites that were kid friendly, had appropriate reading levels, few or no ads, were reliable and did not require an account to view. I generated 3 QR codes and made them into cards. I gave each child their own card (they’re laminated so they will last for many years). Since this is our first project involving online research and note gathering, I am guiding them along the way. I show them how to find the information they need, write it appropriately on the note gathering page and cite the source. We practice this many times until I feel they’ve gotten the hang of it. Right now we are just in the research and note gathering page. Our next step is to take our notes and compose an expository paragraph for a Mini-Bio on Dr. King. After that, we will also create a timeline from the dates we gathered. We also have a Quick Facts page to fill out, too. 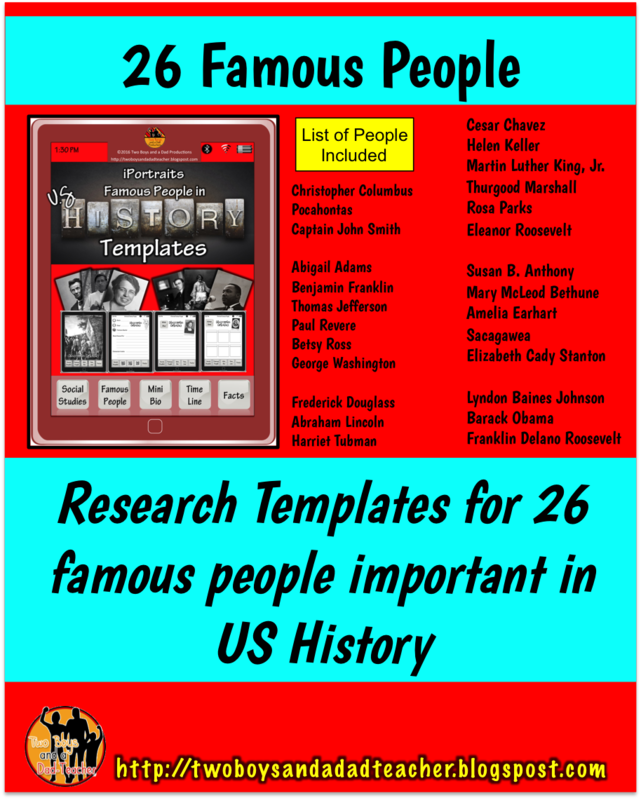 Once all the research has been done, facts gathered, organized and their draft of the expository paragraph has been revised and edited, they will take all this info and publish it on templates that resemble a tablet device. The pages are trimmed then stapled together to make a book. I plan on having the students share their books with each other and with other classes. This research project is actually part of a resource I will soon have available in my store. 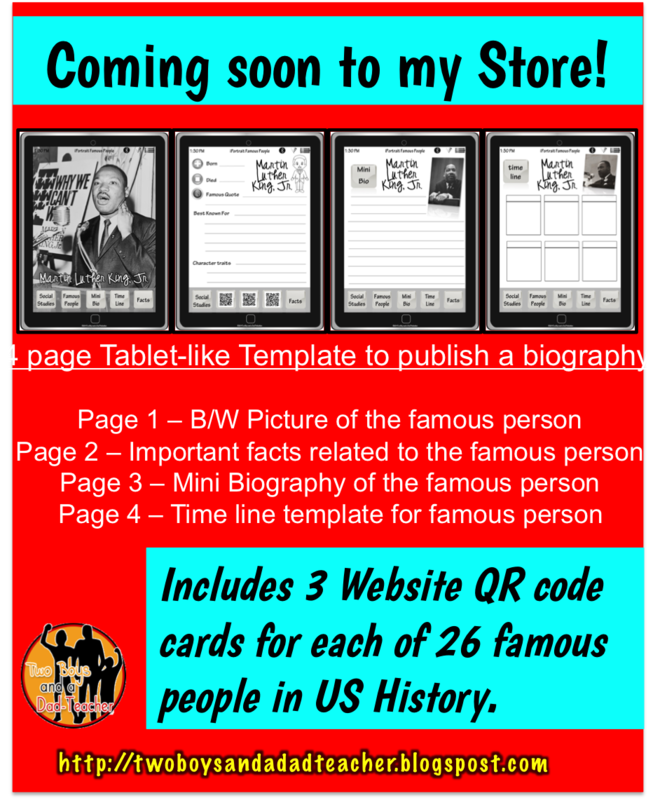 It will include the templates for research on 26 famous people in US History covering from Columbus to modern day presidents. Some time during the year, I also plan on having a fillable forms version of the templates so that students can type the information directly onto the template using a PDF form style. Check my store within the next few weeks for it to be posted. 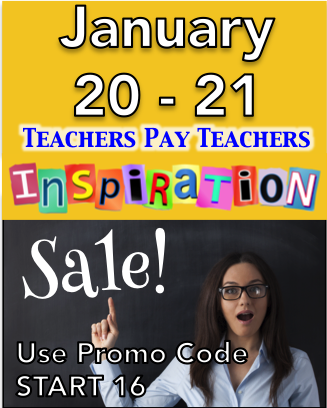 Also, don’t forget that the “Start the Year Inspired TpT Sale” is January 20 – 21. Use the PROMO CODE START16 to save up to 28%!! !